Busby, Brian John. "Thomas King". The Canadian Encyclopedia, 02 February 2017, Historica Canada. https://www.thecanadianencyclopedia.ca/en/article/thomas-king. Accessed 22 April 2019. Thomas King, CM, novelist, short-story writer, essayist, screenwriter, photographer (born 24 April 1943 in Roseville, California). A Member of the Order of Canada and two-time nominee for the Governor General’s Award, King is often described as one of the finest contemporary Aboriginal writers in North America. 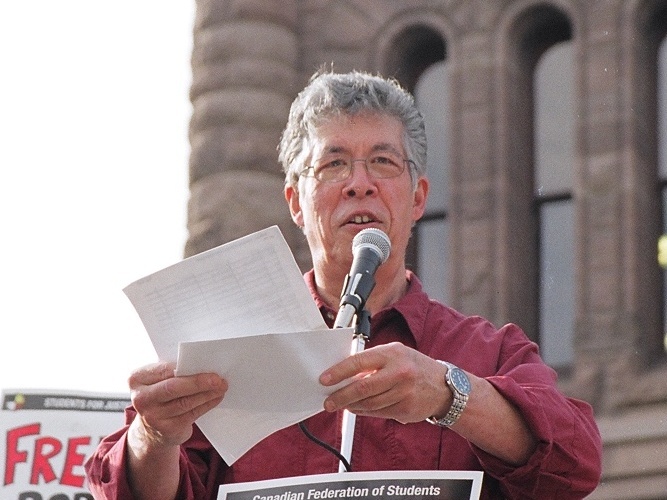 Canadian novelist and broadcaster Thomas King, participating in a protest for Ardoch Algonquin First Nation, Kitchenuhmaykoosib Inninuwug First Nation and Asubpeeschoseewagong First Nation at Queen's Park, Toronto, Ontario (26 May 2008). The son of a Greek mother and a Cherokee father, King failed his first year of university and took a series of jobs that included craps dealer and bank teller. In 1964, he worked his way across the Pacific on a steamer and found employment in New Zealand and Australia as a photographer and photojournalist. Returning to the United States in 1967, King attended Chico State University (BA 1970, MA 1972), and later worked as an administrator and teacher at Humboldt State University and the University of Utah, where he received a PhD in 1986. King emigrated to Canada in 1980, later accepting a position in Native Studies at the University of Lethbridge in Alberta. It was during this time that he began writing serious fiction. His first novel, Medicine River (1990), received considerable critical praise, and was made into a CBC film. The novel was runner up for the 1991 Commonwealth Writer’s Prize. Two of King’s works — A Coyote Columbus Story (1992), a children’s book, and the novel Green Grass, Running Water (1993) — were nominated for the Governor General’s Award, the latter winning the 1994 Canadian Authors Award for fiction. One Good Story, That One (1993) is a collection of ten short stories, including King’s often anthologized "The One about Coyote Going West." A second children's book, Coyote Sings to the Moon, appeared in 1998, and the novel Truth and Bright Water was published in 1999. In 2002, King published a detective novel, Dreadful Water Shows Up under the pseudonym Hartley GoodWeather. Critics and reviewers praise King's funny and poignant portrayal of the challenges facing indigenous peoples in Canada in the past and today. His characters are strong in the face of oppression and prejudice, but they are also fallible in endearingly humorous ways. In 2004, he published a follow-up to his award-winning Coyote Sings to the Moon, titled Coyote’s New Suit, in which Raven, an iconic figure in many Aboriginal cultures, questions the quality of Coyote’s snazzy brown suit. The short story collection A Short History of Indians in Canada appeared in 2005 and won the 2006 McNally Robinson Aboriginal Book of the Year Award. And in 2006, he published another book as Hartley GoodWeather, The Red Power Murders: A DreadfulWater Mystery. King spent 1993–94 as story editor for Four Directions, a CBC Television dramatic series by and about Aboriginal people. He wrote and starred in the very funny Dead Dog Café Comedy Hour, which aired on CBC Radio from 1997–2000. King has edited Canadian Aboriginal fiction anthologies, such as All My Relations (1990) and First Voices, First Words (2001), and collections of critical essays such as The Native in Literature (1987). In 2003 King, was the first Aboriginal in Canada to deliver the Massey Lectures. His presentation, titled The Truth About Stories: A Native Narrative, was later published by House of Anansi press. In 2012, King was awarded a Queen’s Diamond Jubilee Medal. The Inconvenient Indian: A Curious Account of Native People in North America (2012) won the 2014 B.C. National Award for Canadian Non-Fiction as well as the prestigious RBC Taylor Prize. On 30 March 2007, it was announced that King would be the New Democratic Party (NDP) candidate for Guelph, Ontario, as part of the by-election called as a result of Liberal MP Brenda Chamberlain’s resignation. King’s candidacy was endorsed by then NDP leader Jack Layton. The by-election was cancelled when, on 14 October 2008, a federal general election was called. King lost, coming in fourth behind winner Frank Valeriote of the Liberals, Conservative candidate Gloria Kovach, and Green candidate Mike Nagy. In 2004, King was named a Member of the Order of Canada. He is professor emeritus at the University of Guelph, where he taught at the School of English and Theatre Studies department. A Short History of Indians in CanadaA review of Thomas King’s collection of short fiction, A Short History of Indians in Canada. From the Quill & Quire. An Interview with Thomas King (August 1999)A vintage interview with author Thomas King who talks about his writing and his shifting nationality. From Canadian Literature. The Inconvenient Indian: A Curious Account Of Native People In North AmericaSee Thomas King’s book about the historical relationship between Aboriginal and non-Aboriginal peoples in North America. From the Indigo website.